Phox returned to the Pabst Theater on February 2nd for their final goodbye to Milwaukee after years of musical contributions of Americana music to Wisconsin and beyond. Originally from the small town of nearly 2000 residents, Baraboo, Wisconsin, the band is a genuine musical gem. Phox has traveled full circle as a band (figuratively and literally) after having the opportunity to play at Lollapalooza, support the Lumineers at Apple’s iTunes Festival in London and back to their last show in Baraboo before an indefinite hiatus. Luckily for us, we were able to witness Phox and Cuddle Magic in Milwaukee at 1 of 3 of their final shows. Cuddle Magic, and alt-folk band from New York, played in support of Phox as well as their newest album “Ashes/Axis”, which was released on January 27th of 2017. The band is composed of 6 multi-instrumentalist musicians. The sextet took the stage at 8 on the dot sporting blue and tan jumpsuits with their guitars, keyboards, synths and various wind/brass instruments. They began with their performance with a melodic instrumental with exceptional trumpet. At the end of their set, the entire band descended from the stage and positioned themselves in the center of the isle in preparation for an entirely acoustic performance. They presented harmonic masterpiece, completely captivating the crowd. Anticipation was high between transitions, and the energy in the air made it clear that Wisconsin loves Phox. The entire theater took to their feet as the musicians emerged from behind the backstage curtains. After forgetting their backstage ritual, Phox engaged in a huddle-like salute to their performance on-stage. The band began their set with the song “Leisure” and continued into the next song of “1936”, a popular single from their self-titled album. Throughout the show, lead singer Monica Martin held a positive attitude with spontaneous commentary and shared occasional banter with the crowd. 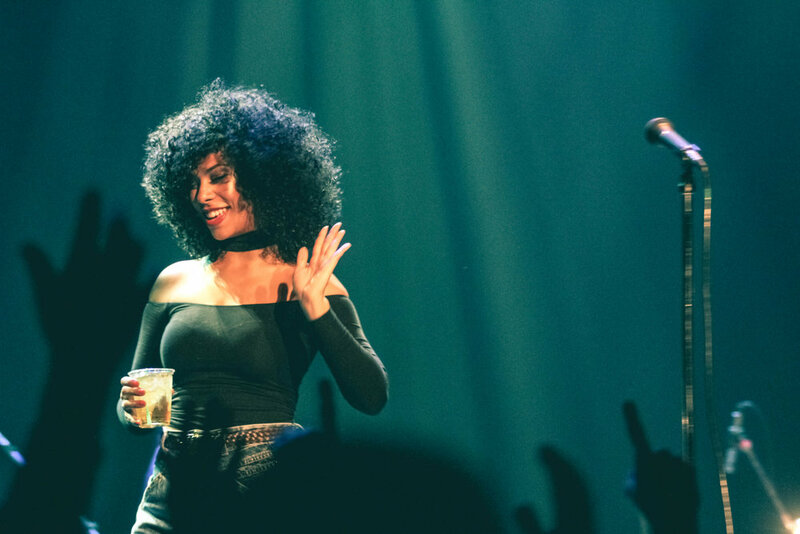 Throughout the show, the band maintained a comforting level of informal commentary and conversation between themselves, giving the performance the feeling that Phox was home. In the middle, a short fit of technical difficulties happened. Martin handled the situation with class by singing an impromptu acapella version of “Sugar Pie Honey Bunch” while the crowd joined in. Phox ended their main set with a cover of Fleetwood Mac’s “Dreams” before their own original “Noble Heart”. Martin has stated that Noble Heart is about "wanting what you can't have." During the beautiful piano intro to Noble Heart, a smile came to Martin’s face, and a single tear was shed, as if she realized in that moment, she had all she could ask for.